Got an old refridgerator you don't know what to do with? 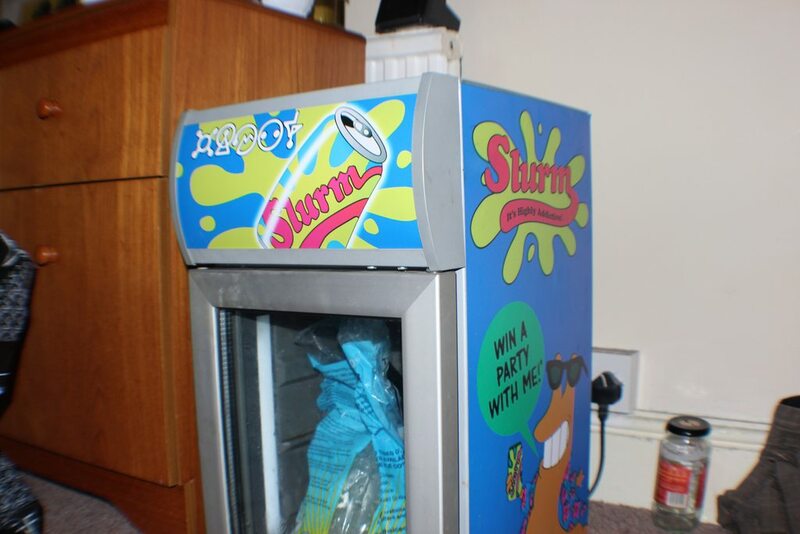 Why not make it into a Slurm™ vending machine. My good buddy dingsda found this while surfing. On the Fan Fiction front we have another one from Dinkdrinker. This one' called The Bride of Rodriguez. What do you s'pose happens when Bender tried to be a Gentle-bot and all around good guy? Maybe, blow up and create a monster? Nah. That couldn't happen. And in the last of our RIPT Apparel T-shirt trifecta, this Dr. Who inspired number goes on sale August 19 for just 36 hours. Be the first to collect all three. Ok, it's time for another T-shirt. Like we mentioned last time the good folks at RIPT Apparel are offering a really cool Futurama-inspired Mario Kart crossover T-shirt which is only going to be available for a short time (short defined as 36 hours). So as soon as the calendar flips over to August 17 in your area, you should be able to click the link nab yourself one. Now, on the other end of the spectrum, here is something that has been available for, well, probably a year or more. It's a Fan Fiction that Dinkdrinker posted on FMMB somewhere over a year ago, and just “forgot” to send to me. It's called Advent of the Mighty-Other which follows up on the Nibblonian prophecy of 'The Mighty Other'. And since Fry and Leela are expecting another child, the Nibbloanians feel the prophecy is coming to pass because, according to Nibbler and his people, the child will save the universe. That is of course if Fry and Leela survive long enough to actually have the kid. Ok, let's start out tonight with a shameless commercial plug that has the very real danger of getting me a free T-shirt (I sell out cheap these days ). I got this very nice e-mail from Allie who is a Marketing Intern with RIPT Apparel who are offering this very cool Zoidberg inspired T shirt for a paltry US$11 each. The catch? It goes on sale August 6th (a mere day away, give or take a time zone or two) and will only be available for 36 hours before, as I'm Allie was programmed to say, “ it�s laid to rest in our Graveyard forever”. First is Nabbed! by Spaceman130. It's inspired by the PlayStation 3™ game Vampire Rain™, missions 10 and 11 and in it a member of Fry's team gets abducted by nightwalkers™ and it's up to the crew to pick up the pieces before it's too late. And Dwayne Anderson weighs in with part 14 of his fic Space Ace Doofus in which some AU action caused by Fry's fascination with a popular new video game and a malfunctioning new invention of the Professor's just keeps getting weirder for our lost interdimentional traveler. And lastly, I received a note from Robin at Focus Online Management Ltd in the UK. They've put together this really neat round-up of retro cartoons from the 1960's to the 2000's called Those Were The Days which features top cartoons of these decades, and Futurama made the list of course! I love how the TV changes depending on the era. Check it out!